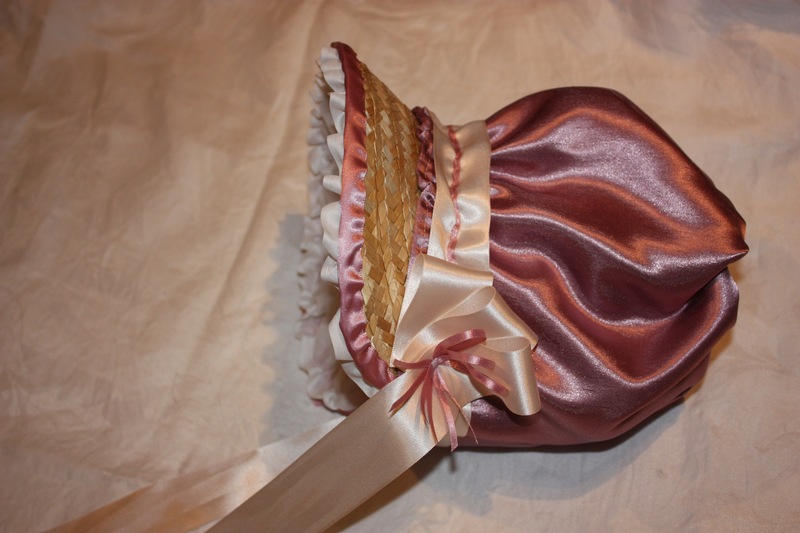 The poke bonnet was fashionable at the beginning of the 19th century, and consisted of a small crown and wide brim to shade the face. 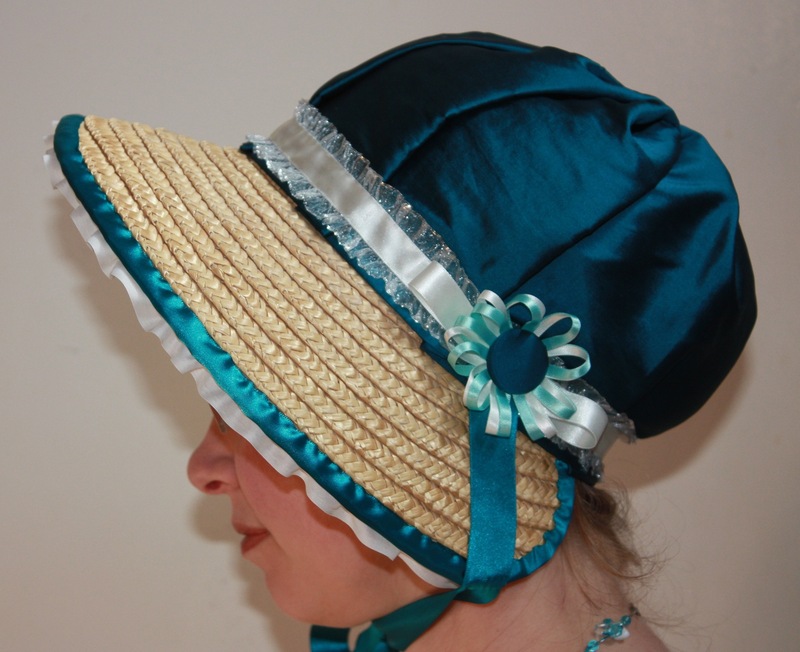 From 1830 through to the 1840s, the shape of the brim became more tubular in shape and increased in size until the wearers face was only visible from directly in front. 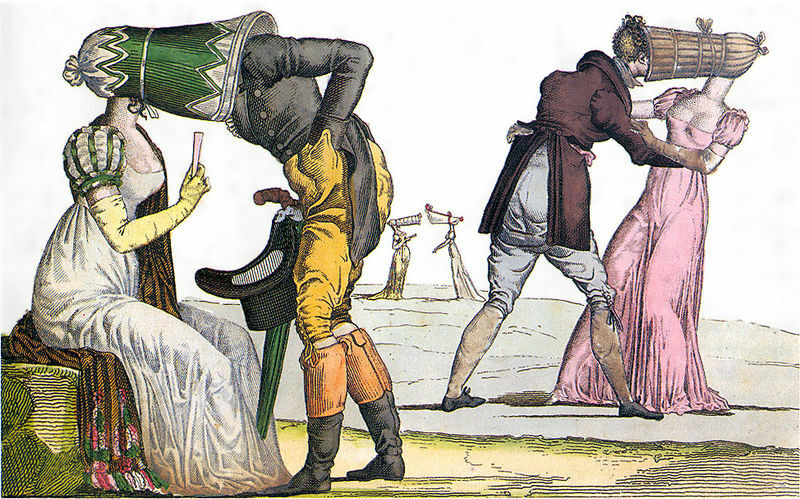 A French satire print on the poke bonnet in the 1810's; "Les Invisibles en Tete-a-Tete". The bonnets were called "invisibles" in France because the face of the wearer was virtually concealed except from the front. The Gentleman’s Magazine proposed (tongue-in-cheek) the formation of a Female Convocation or Parliament in order “to regulate dress in all its changes and varieties” (1807). The author drew several comparisons between the all-male Parliament and its female counterpart, with particular mention of the poke-bonnet. Men may act very perversely in questions of peace or war, but there would be little room for animosity in discussing the height of a turban, or the colour of a shawl; men may be warm on extending the militia, or increasing the army, but there would be more liberality in puckering a handkerchief, or gathering up a petticoat; in enacting a poke-bonnet, or proposing an amendment in the straw-hat bill; I have no doubt, indeed, that all the members would be so duly impressed with a sense of the importance of their office, as to discuss with most becoming temper, the dimensions of the square bust, the curvature of ringlets, the necessity of indispensibles, the side over which the veil is to fall, and the manner in which the dress should be broached on the shoulder, with every other circumstance of equal importance to captivate and conquer. The Gentleman’s Magazine, Volume 100, January, 1807. Thread, scissors, needle, pins, safety pin, sewing machine. 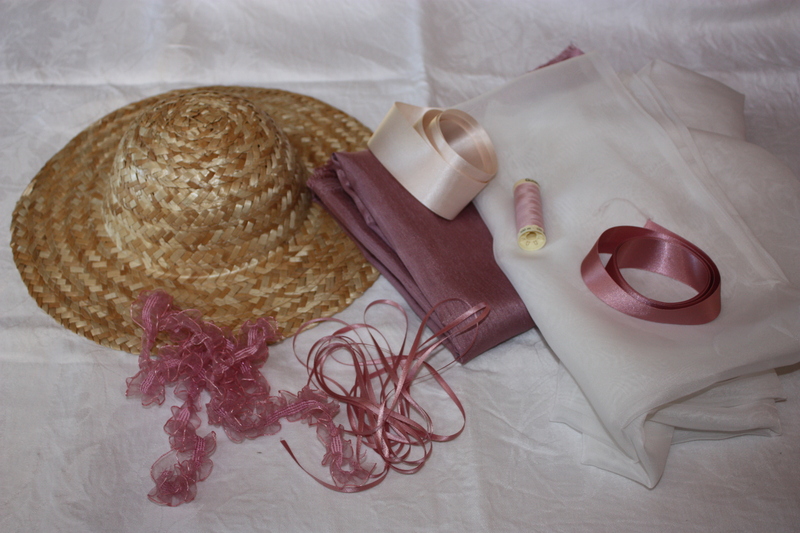 Begin by bending the straw hat in half to decide on the shape you want for your bonnet, and then cut the hat in half. My straw hat was quite small, only 25 cms in diameter. Bind the edges of the hat with bias binding or ribbon, using a needle and thread. Gather the lining material about 1cm from the selvedge edge. 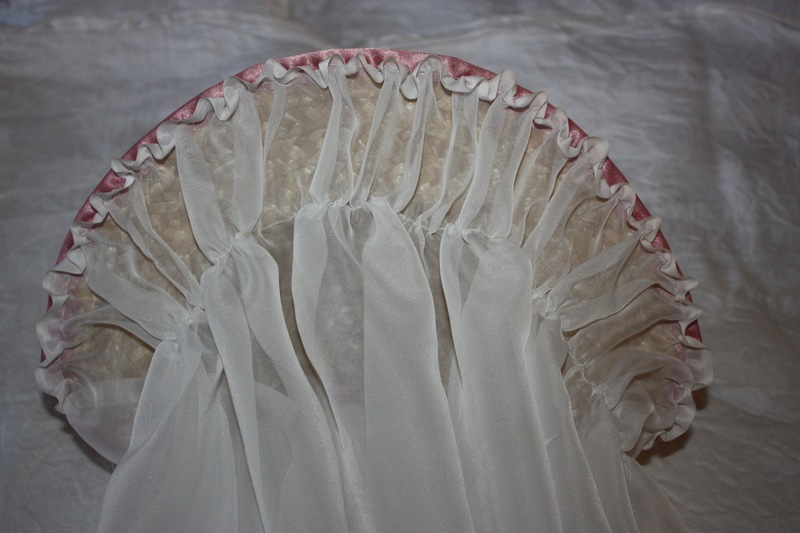 I used a thin voile, similar to chiffon, with a selvedge edge that was 1 metre long. Measure the width of the brim, from the brim edge to the base of the crown, and do a second line of gathering stitch that same distance from your first line of gathering stitch. You can see from the photo below that my two lines of gathering are approximately the width of the brim. Hand stitch the first line of gathering stitch to the binding on the inner edge of the brim, using a simple running stitch. The second line of gathering stitching should rest along the base of the crown of the hat. Pull the gathering threads tighter to fit. You can attach this line of gathering to the base of the crown with a hot glue gun or some hand stitches, but I left it loose. 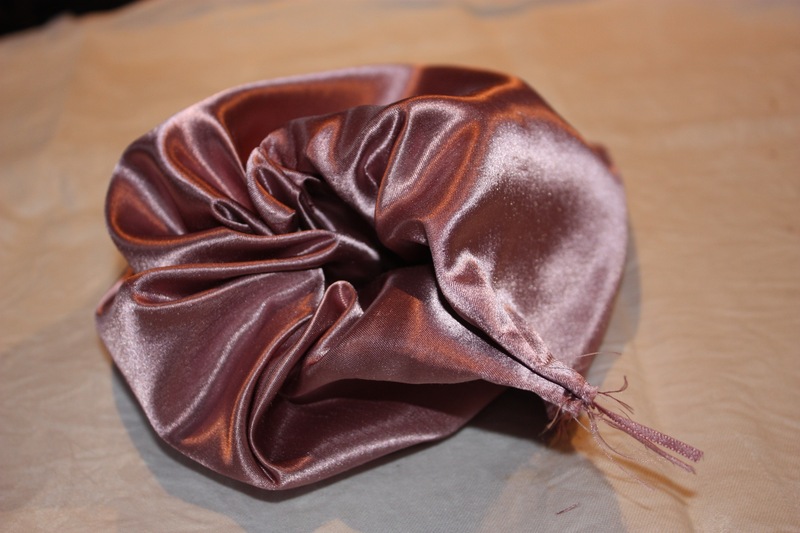 The lining will now have a lot of fullness inside the hat. 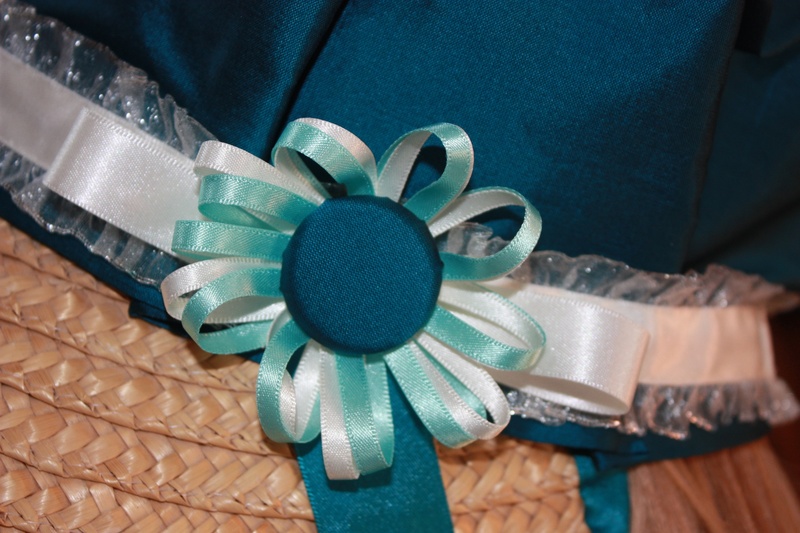 Trim it level with the bottom edge of the straw hat, and then bind the raw edge by hand sewing another piece of bias binding or ribbon along it to prevent fraying. For the crown of the hat, fold your piece of material (mine measured 45 cms x 60cms) lengthwise to form a rectangle. If you would like a more gathered crown, make your rectangle longer; alternatively, make it shorter if you would like an ungathered crown. In order to have a decently gathered crown, the length of your folded rectangle would need to be at least 2 times the circumference of the base of the crown of the hat. Sew the short ends of the rectangle together to form a tube, leaving a small section (0.5 cms) unstitched closest to the folded edge. This will enable it to be gathered with ribbon in the next step. Then you can pull it tight and knot it so it forms the top of the bonnet. 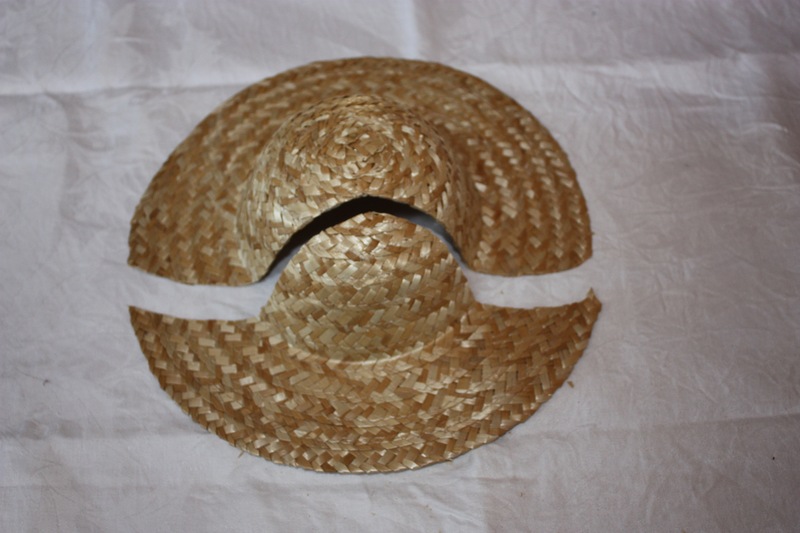 If your crown is very loose on the straw hat, it will need to be gathered to fit. 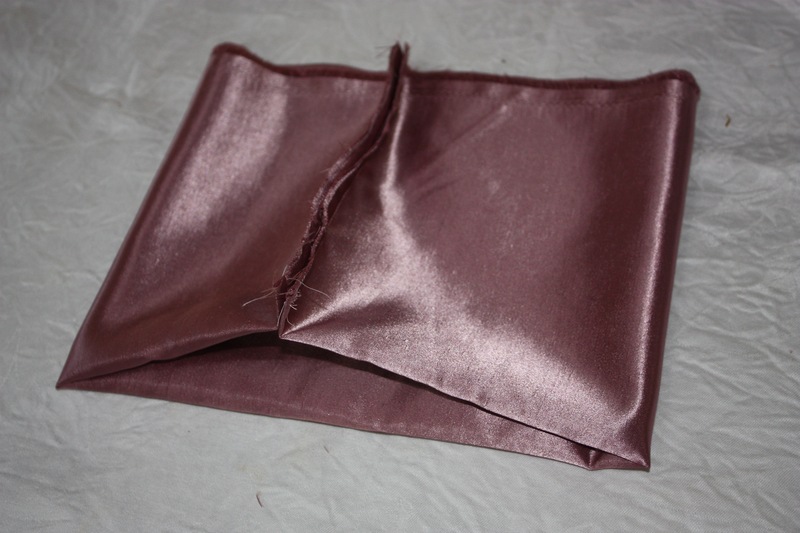 In order to hide the raw edge, you can either turn it under and sew it (as I did), or bind the edges with bias binding, ribbon or a long strip of fabric. 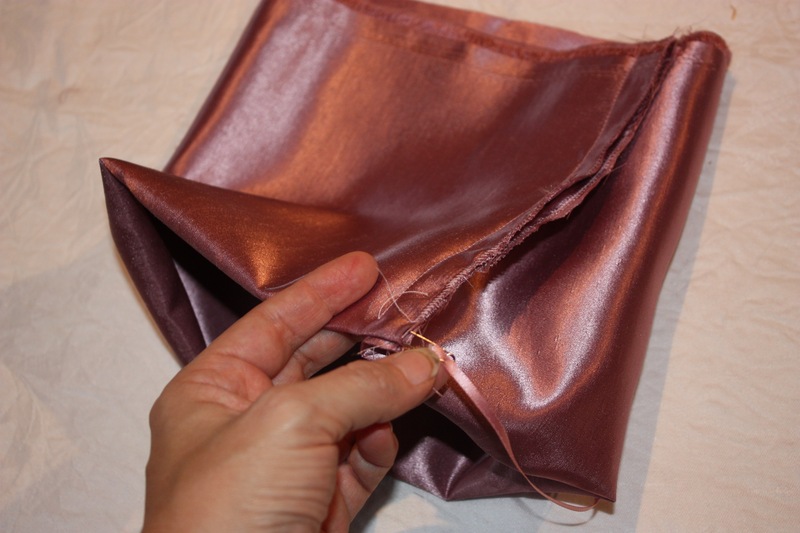 Sew two lines of gathering stitches and adjust the gathers to fit the base of the crown. 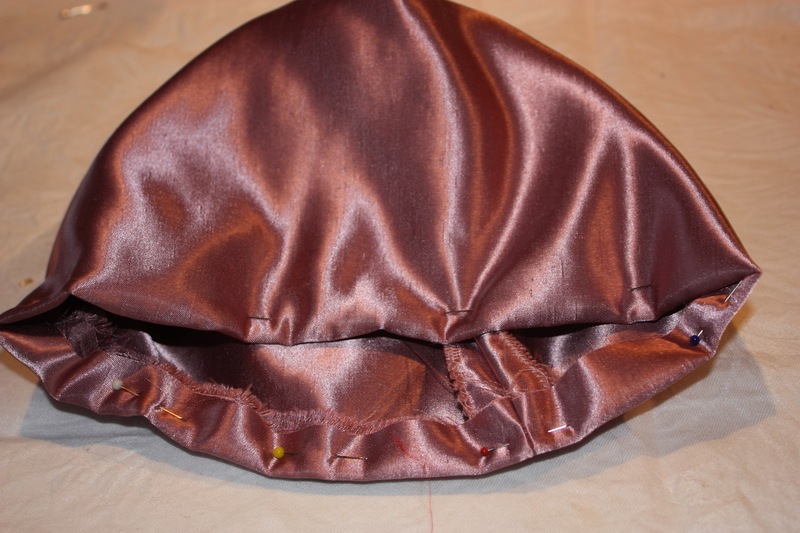 Pull it down over the base of the brim (where the nape of the neck would be) so it holds the hat in a bonnet shape. (Try it on at this stage, just to make sure it will fit your head!) 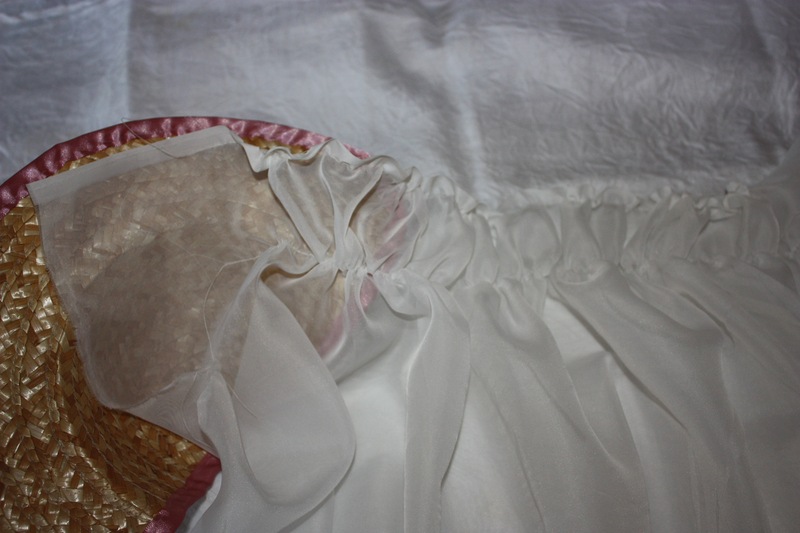 Then, using a basic running stitch to attach the crown, hand sew through all layers. 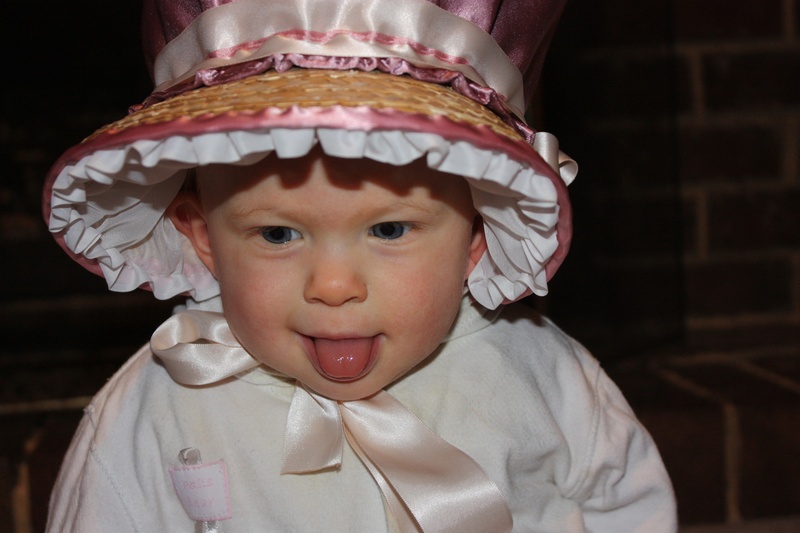 Decorate the bonnet with ribbon, lace, feathers or other trims as you wish. 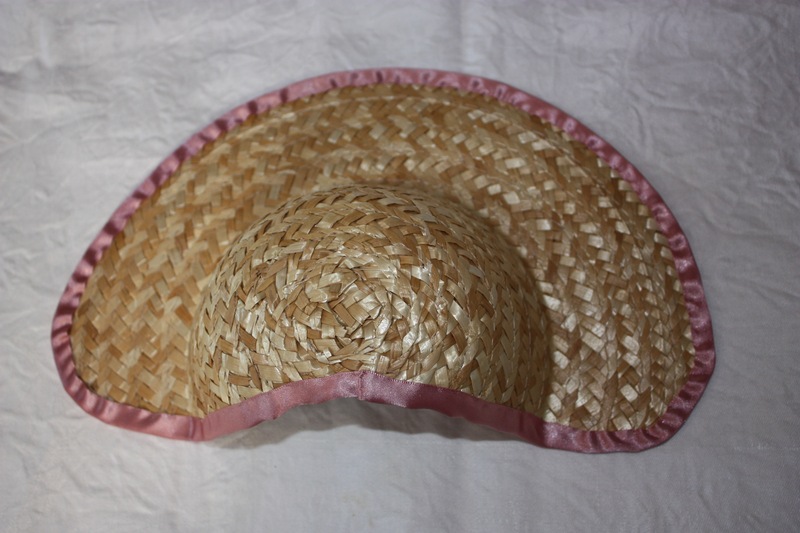 I used a craft straw hat that was 25 cms in diameter (designed for a doll, I imagine), so it was not large enough for me! The Intended Recipient, my youngest daughter, was duly impressed! Buy a thimble!! I bled all over my bonnet several times! Use a foam head, as it will help you decide how best to shape your bonnet. The more “invisible” your hand stitching, the better the result. 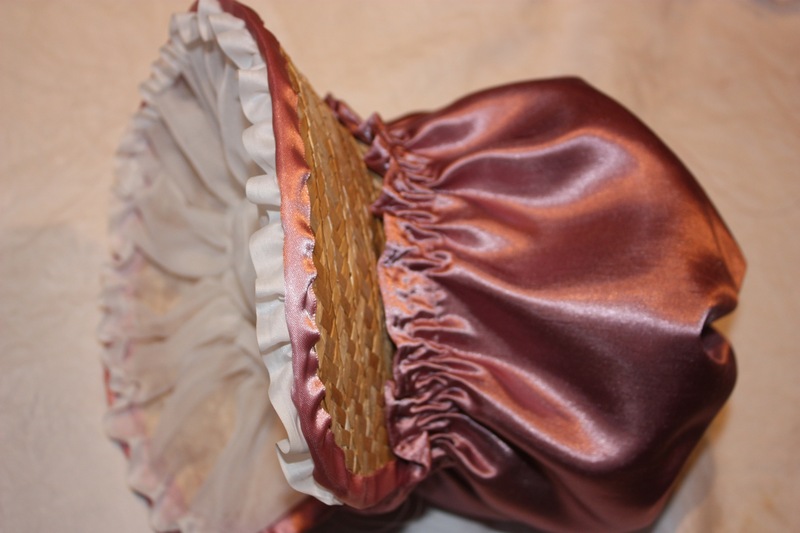 I made these bonnets by following a tutorial given by The Oregon Regency Society. 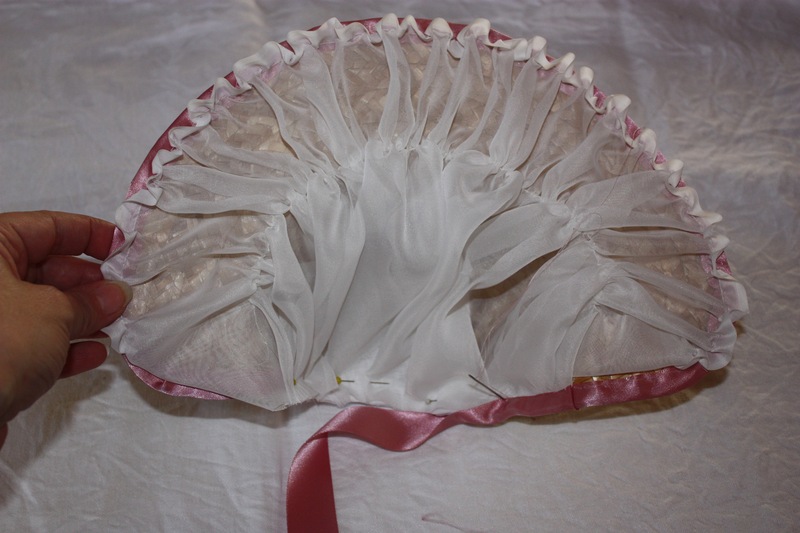 The author also gives alternative ways to construct a bonnet for those who are not sewers, and has another tutorial on making a Regency stovepipe bonnet. 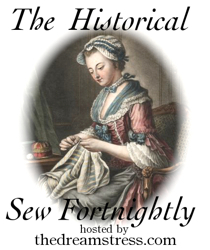 I love historical fashions! They are my cup of tea! From the Neck Up: An Illustrated Guide to Hatmaking, By Denise Dreher – This is a great book on the different techniques required for successful millinery, and also includes a basic pattern guide to the various fashions in hats through history.